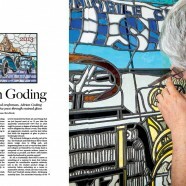 Octane magazine feature Ketton Stained Glass with the focus of the article on both myself and the Panhard stained glass panel. Click on the thumbnail to view a pdf of the article. Octane magazine is a leading quality monthly magazine that focuses on the world’s greatest classic and performance cars. Octane’s experienced editorial team draws on the skills of international personalities, motoring journalists, racing drivers, historians, automotive experts and photographers to create what is now described as being ‘the best classic car magazine in the world’. Through its personal contacts, Octane road and track tests the rarest and most valuable historic sports cars that are not available to other motoring magazine, as well as the finest motor cars. 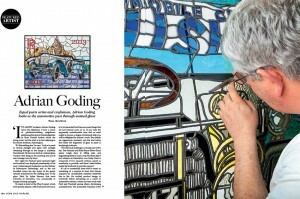 Octane covers other good things in life that appeal to its well-heeled readers which I hope is why they wanted to feature my stained glass. The Panhard panel continues to attract interest from around the world.